We continue with Cormac Gallagher’s translation of Lacan’s L’Étourdit. The First Turn: the signifier and the absence of sexual relationship, was published in The Letter, Issue 41, Summer 2009. The Second Turn, first part was included in The Letter, Issue 43, Spring 2010. 1. The psychoanalytic group is impossible (31a-32c) I have the task of clearing the way for the status of a discourse, there where I locate that there is… something of discourse: and I locate it from the social bond to which are submitted the bodies that labitent2 this discourse. My undertaking appears hopeless (is so by that very fact, this is the result of hopelessness) because it is impossible that psychoanalysts should form a group. Nevertheless, the psychoanalytic discourse (this is me clearing the way) is precisely the one that can establish a social bond cleansed of any group necessity. Since people know that I do not mince my words when it is a matter of putting into relief an appreciation which, though deserving a stricter approach must do without it, I would say that I measure the group-effect by the amount of imaginary obscenity it adds to the effect of discourse. People will be all the less astonished, I hope, at this saying because it is historically true that it is the coming into operation of analytic discourse which opened the way to so-called group-work and that this work only gives rise to an effect, dare I say, purified of the very discourse which allowed it the experience….. This continuation of Christian Fieren‟s 2002 book, Lecture de L‟étourdit. Lacan 1972. (Paris: L‟Harmattan, 2002), is translated here into English by Cormac Gallagher. Fierens follows the four sections of Lacan‟s work, in the previous paper, and in doing so, provides an excellent exposition of the many difficult passages, allusions, and references. In so doing, he enables us to re-read Lacan which facilitates a movement which goes beyond the meaning of the said, to the ab-sense of the sense. This opens up everexpanding vistas as symbolized in aspherical topology which provides a path to the enormity of the task involved in psychoanalytic discourse. (209) Analysis operates from ab-sense and has only one reference: the phallic function developed in the topology of the cross-cap….. This Prologue is a road map for the circuitous journey which Le Gaufey will follow in his work on the Logic of the Sexual Fault-Line, which can be read as a continuation of the Prologue. The starting point is classical logic, then moving on to the quarrels of logic in the Middle Ages and coming to an endpoint at Lacan‟s changes to traditional logic which enabled him to develop his formulae of sexuation. Borromean knot, neither one nor two. Logic is not known for its close relationship with the sexes. The p‟s and q‟s that populate propositional calculus do not stimulate licentious thoughts in many. Likewise inasmuch as we think about the sexes we imagine them as poorly regulated by the literal rigour that makes logic stick to its priapism with regard to the truth…..
Lacan put the work of the cartels at the core of the transformation of the analyst. His design follows Freud‟s model of hierarchical organisations but modifies it in order to establish it on a rigour and logic which would facilitate each member of the cartel to develop his/her own subjective intuition in pursuit of their own transformation as analysts. 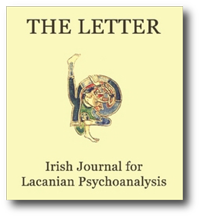 This paper follows the trajectory of Freud‟s analysis of groups, to Lacan‟s circular organisation. The author suggests that if Lacan had used a model of the torus as a basis for his invention, that the results might have been more in line with what he aimed to achieve. Introduction: Cormac Gallagher‟s paper The Founding Act, the Cartel and the riddle of the PLUS ONE in Issue 44, Summer 2010 of The Letter points out the failure of the cartels over the last fifty years. He attributes this failure to the „confusion, partly cultivated by Lacan, around the real or imaginary status of [the] plus one and its function in promoting the work of the cartel.‟….